I love Nyonya food, always colourful and full of flavours. I was going to make some stuffed squids with minced prawns at the weekend, as it turned out my packet of squids wasn’t as good as I thought once defrosted, the size varied and they were far too thin. Got the squids and prawn defrosted so I decided to make Sambal Udang (prawn sambal) with added squids, kind of seafood sambal. It was very tasty and I had it with Nyonya salad which was spicy and tangy. Put all the ingredients for rempah in a mini blender and blitz till the paste is smooth. If too dry add a little water to blend. Heat oil in wok or pan till hot, add in curry leaves till sizzle, then add rempah and stir for 5 – 10 minutes till the oil separates. Add coconut milk and tamarind juice. Taste add salt and sugar if wish. Add slice onion and stir till onion is softened, add tomato wedges, stir till hot. Turn the heat right up and add prawns and squids, stir fry for about 2 minutes or till the prawns and squids have turned colour. Don’t overcooked. For the garnish I use cucumber slices and a large chilli cut and dipped in cold water till it opens up into a flower. This salad though very simple it is bursting with flavour, hot and tangy. Very very simple just mix everything together. 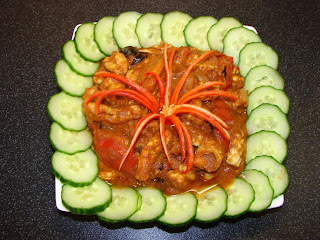 For the sambal belachan, this is a typical no cook recipe. 1. If using block belachan, slice the belachan into 4 -5 mm thick and roast on a dry pan. Beware very strong smell, open all windows and close doors where applicable. Roast till brown. If using Thai belachan, this will be in lumps scooped out from the tub. 2. Put all the ingredients in a mini blender and blitz till very smooth, add some water if too dry. The sambal should look very thick, will keep in the fridge for weeks. 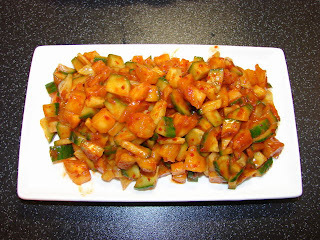 Sambal belachan is very versatile and use in lots of Malaysian/ Nyonya cooking, or use as condiment with a sqeeze of lime. Glad you like it. The recipe is also nice with fish or chicken pieces. I tried to make this but some how the colour turned out black, not red like yours. Any idea? I have no idea why your seafood sambal turned out black. - Did you burn the spice paste while cooking. - Did you use squid with ink? - Was the tamarind too much or too dark in colour? - Did you use enough chillies, chillies give it the main red colour. Without knowing what you use and how you cook it, I can really help you. Baked char siu bun with pineapple topping.